Alarming stories like these are becoming all too common. Medical mishaps may seem like infrequent occurrences, but they are happening today with frightening regularity. According to Mary Wakefield, Director of the Center for Health Policy Research and Ethics at George Mason University, in her address to the United States Congress on the Quality of Healthcare in America, 98,000 people die yearly as a result of medical errors, making medical mistakes the eighth leading cause of death in the country ahead of traffic accidents, breast cancer, and AIDS. Although many groups are working to provide solutions to this ever-increasing problem (numbers of medical mistakes are rising annually), I would like to offer the most obvious and most overlooked solution to this dilemma: Stay out of the American medical system as much as you possibly can! Please take a few minutes to digest this seemingly outlandish advice; I know it sounds alarmist. Once you do, however, you will realize that this may be the most valuable guidance you have ever received; advice that, at the very least, could save your life; but more importantly can lead to increases in your health and wellness. Imagine that! For nearly a century, we as Americans have been led to believe that, in order to stay healthy, we need to combat illness with one drug or another. We have been taught that we are susceptible to all kinds of stressors that can negatively affect our health, most notably microorganisms (viruses and bacteria). In fact, the modern medical philosophy is that we are so vulnerable to microbes/germs that we need a constant influx of medications in our bloodstream to preserve our health. Anybody visiting their doctor for a cough may attest to this, as they are generally given an antibiotic to combat these germs (please note that antibiotics are useless against viruses, yet they are freely prescribed to combat them anyway). Without a doubt, both prescription and over-the-counter medications are useful, so it is not my intention to stand on a pulpit and declare all drugs evil. But the overuse and downright abuse of medications in this country are partially to blame for the unacceptable rate of morbidity and mortality due to medical error. It is well known that many deaths are caused by both adverse drug reactions and drugs being wrongly prescribed to patients. So I must ask: Does the problem lie with the doctors that are making the mistakes, or is the problem inherent in a system that freely prescribes medications for even the most minor ailments? In my opinion, the problem is even deeper than that, as it is rooted in Western ideology that there is a quick fix for all our health woes. Only two years ago, the United States ranked as low as 17th when assessing the healthiest nations in the world. Seventeenth, despite being the most technologically advanced country in the world, and also spending more than any other nation on healthcare. For all the money spent annually ($1.5 trillion), the U.S. can only manage to rank 17th worldwide? Does this make sense to anybody? Not until we realize that our reliance on drugs and surgeries to maintain human health is not just costly but also foolish will we ever see our rankings improve. The only way to ensure good health is by making healthy lifestyle choices. Phillip J. Longman, writer for the Washington Monthly, points out that the eight leading causes of death (aside from those caused iatrogenically) are due to people's lifestyle choices. (See also http://www.who.int/mediacentre/factsheets/fs310.pdf/.) Heart disease, cancer, stroke, pulmonary diseases, accidents, pneumonia/influenza, diabetes, and suicide are all linked to behavioral choices and living conditions. The Institute of Medicine states that diet, smoking, alcohol use, and sedentary lifestyle contribute to approximately half of all deaths in this country, while those behaviors lead to about 75% of all cancer deaths. With these facts so evident, isn't it a wonder that so much money is spent combating the effects of faulty habits as opposed to teaching good ones? and may not apply to everyone, particularly those in the later stages of chronic disease). 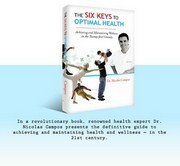 To achieve and maintain optimal health, one needs to place thought and action into six fundamental areas. I call these areas The Six Keys to Optimal Health. If regular attention is paid to these six key areas, it will be almost impossible not to enjoy improved health and vitality. The first key is diet and nutrition. Fortunately the last three decades have witnessed a surge in attention in this all important area. The bottom line here is, "you are what you eat". To function properly, the body is dependant on various nutrients at their proper proportions. That is, not only is getting nutrients like B-vitamins, protein, and anti-oxidants of utmost importance, but the quantity we get is also paramount. Too much or too little of any one nutrient can lead to ill health. Many of today's disorders are caused by malnutrition despite our thorough knowledge of the subject. One reason for this is America's obsession with processed and fast foods. These foods just do not provide the nutrients needed for a healthy diet and are often laden with "bad" fats and are high in calories. Junk food sales are at an all time high and matters are made worse as we are encouraged to "supersize" our meals. Fortunately, one fast food chain has decided to discontinue this practice as health, particularly within the realm of diet and nutrition, is permeating the public consciousness. In addition to getting the proper nutrition for your body by way of food, it is also important to be properly hydrated. Many people just are not. There are several disorders directly related to poor hydration, too numerous to go into here. Suffice it to say that drinking water is right up there with breathing; your life depends on it. A good rule to follow is to drink as much in ounces as you weigh in pounds. So if you weigh 150 lbs., drink 150 ounces daily (3 liters). If this sounds like a frighteningly large quantity to you, then you are most likely not getting enough water on a daily basis. The bottom line to this key is to watch what you eat on a regular basis. In my opinion, whole natural foods are better than canned, frozen, or processed foods. I also believe that meats should be hormone free (check your local health conscious supermarkets) and I generally prefer to buy organic produce. I also believe that everyone can benefit from supplementation with vitamins and minerals. Each individual will differ in what he or she needs, but a good multi-vitamin is a definite start. Consulting with a holistic doctor or nutritionist is a good idea to determine which vitamins are right for you. The next key area involves exercise and physical fitness. Once again, the importance of this key area has been extensively studied and well understood for several decades now, thanks primarily to the practices of body building and yoga. The fitness industry has exploded in the U.S., due in large part to the increase in public awareness of the importance of regular exercise. Health clubs are now as plentiful as supermarkets in many regions and yoga studios seem to be popping up everywhere. At least that is how it appears here in Southern California. Without listing every benefit that a regular physical fitness program can provide, some of the major benefits provided by exercising are increased cardiovascular function, enhanced sexual function, and better mental health. This is not something to be taken lightly. If all aspects of one's health can be dramatically improved by regular physical fitness, then why isn't every one doing it? The good news is that a majority of Americans are and the numbers are increasing every year. Please, if you are not exercising regularly at this time in your life, start today. The third key has to do with rest and recuperation, or quite simply sleep. Sleep is one of those activities, like breathing, that is taken for granted. Most people put very little thought into it whatsoever, but I can not stress enough the importance of getting the proper amount of rest. Many functions occur during a normal sleep cycle from cell regeneration to memory storage and, without sleep, these vital processes are unable to proceed normally. This can lead to premature aging and degeneration of various organ systems. Therefore, if you have the tendency to sacrifice your sleep in order to participate in other less important activities, then be warned that you are slowly but surely damaging your health. If you realize that any activities you enjoy will be enhanced if you are well rested, then you should have no problem setting aside time to perform this essential function. Furthermore, if you in any way interested in looking your beautiful best, then you will also want to get your nightly eight hours of sleep. During sleep, proteins needed for muscle, skin, hair, and nails are all built up and regenerated. This process is called anabolism and is more important than any of the external cosmetic products or procedures that Americans spend millions of dollars on every year. The most important thing you can do in this area is try to develop a pattern of sleep that is essentially the same every night. Erratic schedules are probably the most common cause of sleep disorders like insomnia. By creating any sort of regular sleep habits, you essentially guarantee that you will receive the proper amount of sleep nightly. Do not rob the sandman, as you will pay the price in decreased health and premature aging. The fourth key is related to mental and emotional well being. Although there has been endless debate over mind-body duality, most forward thinkers in healthcare will find it difficult (if not down-right impossible) to discount the importance of the mind in the healing process, as well as its importance in the overall health of the individual. There are numerous ways in which one's mental disposition can affect one's health. Whether clinically depressed or merely partaking regularly in negative mental activities such as self loathing, jealousy, pessimism, and even bad mouthing others, one's mental state has an enormous impact on one's health. Mental health is not easily understood nor is it easily mastered. If you find yourself suffering from a difficult mental or emotional state, take action steps to address it. Whether that means seeking help from a trained professional or support group, reading self-help books, or just making adjustments to your perception of a particular situation, do not just sit back and do nothing. Seek out possible solutions, as mental burdens can take their toll. Medications to combat "stress" or "anxiety" are some of the most over-prescribed in our society. There is no quick fix for any problem. Many mental problems are a result of a convoluted perception that we may have of a situation and how we want things to be. When reality does not match what we believe it should be, we feel pain. Antidepressants prevent people from feeling and experiencing this pain that accompanies all challenging moments in life. They should probably be called anti-evolution medication as most people on long term antidepressants get "stuck" in their own growth. Many believe they need these meds to cope, but what they are really doing is shutting off their emotional responses. It is true that some people turn to antidepressants to help them through a trying time like the loss of a loved one, but far too many people use them to keep from feeling those difficult emotions we all have to face at one time or another. Even those who truly need antidepressants at some point must eventually wean off of them or risk complete dependency. The next key to observe and master is toxin avoidance, that is, limiting the amount of toxic substances you put into your body. Toxins are essentially poisons that damage your tissues when taken in large quantities or taken repeatedly over time. Many substances can act as toxins. Some of the more obvious ones are tobacco, alcohol, smog, pesticides, household chemicals, lead, and asbestos. Other less obvious ones, but none the less harmful, are prescription medications and over-the-counter medications. Even large quantities of fat soluble vitamins like vitamin D can damage healthy tissue, while some herbs used medicinally can be toxic to the liver. The important thing to understand regarding toxic substances is that what one does occasionally is unlikely to have dire consequences on one's health. The "occasional" drink or smoke is not really such a big deal and can even have positive mental effects, like relaxation or pleasure. Unfortunately, when used regularly, these same substances become highly toxic. Smoking a pack per day, using ibuprofen regularly to ease pain, or taking antidepressants regularly to "cope" can all damage the body and its tissues over time. As a result, degenerative and chronic diseases like heart disease, liver failure, emphysema, and cancer can occur. It is in the best interests of your health to understand the risks of anything that you are putting into your body. We all know the risks involved in smoking, but many people are unaware of the ones inherent in taking prescription drugs. There is a common misconception that if something comes from a doctor then it must be safe. This often leads to indiscriminate use of the drug. Please understand that all medications have side effects, and that they are toxic to the body in high doses or with repeated use. Most doctors will not take the time to inform you of these side effects. Do yourself a favor and become informed about what you are taking. Most information on drugs and medications can be found on the web. Read the list of side effects that come with each medication. You may be shocked. Do not leave it up to anyone else to tell you about these effects and do not take chances. As was said earlier, most diseases are direct consequences of our own lifestyle choices. Choose wisely, and you will live a longer and healthier life as a result. The sixth and final key is receiving regular body work. Chiropractic care is the most comprehensive of all the body work disciplines as it has an effect on joints, bones, muscles, ligaments, blood vessels, and the nervous system. Yet massage, acupuncture, spa therapies (facials, scrubs, wraps) all have benefits of their own that are far reaching. Not only does regular body work feel good, it also ensures that our physical (musculoskeletal) parts are functioning properly. The theory behind chiropractic care is that misalignments in the spine (subluxations) create interference in proper nerve function. By correcting these misalignments, the nervous system is allowed to work optimally as the master control of the entire body. Without a properly functioning nervous system, organs are put under stress, as the signals they receive from the brain are distorted. This type of situation is very similar to a damaged computer chip. In this scenario, programs run haphazardly, if they run at all, which makes them useless, as they can no longer perform the functions that they were intended to. In addition to keeping the nervous system "fine tuned", chiropractic care enhances one's looks. By removing spinal misalignments, chiropractors also re-align the spine, improving posture. Look at athletes and movie stars who have perfect posture. Don't they look younger, more vibrant as a result? It is no wonder that pro sports and Hollywood alike have been utilizing chiropractic care for decades. If they entrust their million dollar bodies to chiropractic care, do you think that there may be more to it than just pain relief? In addition to chiropractic care, massage therapy can do wonders to remove stress that builds up in your muscle tissues. It also increases blood and lymphatic circulation, preventing fluid stagnation that can lead to varicose veins and blood clots. By taking the time to put attention into your body, you will assure yourself properly functioning cells, tissues, and organs. By following the Six Keys to Optimal Health, you stand the greatest chance of keeping yourself healthy and staying out of the medical system. The medical system is in place to care for "sick" people. Follow the Six Keys and the chances of getting sick decrease exponentially. Fall into the system and you run the risk of becoming one of the 98 thousand who die yearly from medical errors. Why take chances? Do the right things and you won't have to.